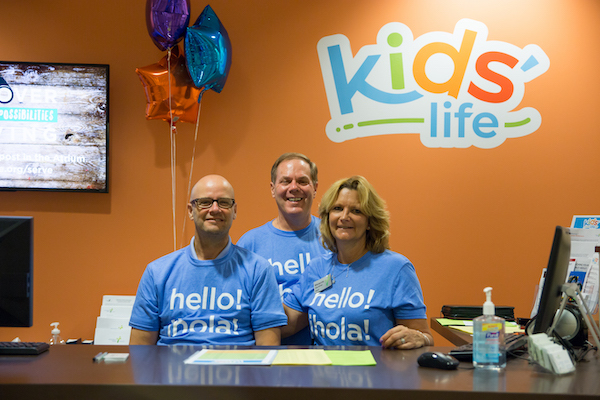 Wheaton Bible Church loves kids—and we consider it an honor to partner with parents to help their kids grow to love God with all their hearts. We encourage families to attend worship services together on Sunday morning and to serve together as a family, either within our church or in our community through one of our Local Outreach opportunities. Our Sunday-morning age-graded ministries give kids and students a place to connect with friends, build relationships with staff and volunteers who love Jesus, and grow in their faith. Age-specific classes are available during all services for infants 6-weeks through grade 6 in our Kids' Life ministry. Check-in is located just outside the southwest side of the West Worship Center on the main level for kids pre-K and younger. Check-in for elementary students is located on the lower level on the southwest side of the building. We also offer many other children's activities on Sundays and throughout the week. Junior high students in 7th and 8th grade meet on Sunday morning in the Warehouse—during the 10:30 am service—for fun games, energetic worship, and solid Biblical teaching that will show students how to own their faith in an often-confusing world. High school students are encouraged to join in worship and in serving as volunteers on Sunday mornings. They may attend services with their families or join other students and leaders in the contemporary services in the West Worship Center at 10:30 am. Students gather in the Atrium to connect before going in to service together. Our Shine Ministry offers Sunday morning self-contained and inclusion classes where those with special needs can find community and learn about loving Jesus. Shine also offers support, encouragement, and fellowship to the families of those with special needs.